Experience American’s best seat for the price of economy on select domestic routes early next year. From January through April 2017, American Airlines is using its flagship Boeing 777-300ER on select domestic flights, which means that it’s selling international business-class seats as part of the economy cabin for these flights. You can purchase these as Main Cabin Extra seats, which Platinum and Executive Platinum members can select for no extra charge. It’s rare to see an airline make improvements to its frequent flyer program. This week, Alaska Airlines shared the details of some positive changes to the Mileage Plan frequent flyer program. Now, members will have access to reduced mileage redemptions, they may earn more miles when flying with select partners, and elite members are now eligible for complimentary upgrades on award travel. Score a luxurious first-class seat when you take advantage of these usually undervalued frequent flyer programs. With the major US airlines seeing devaluations to their award charts and routing rules — not to mention moving to revenue-based programs — it’s no wonder many people are frustrated with their award travel options. However, by looking beyond American, Delta, United and other big US carriers, you can still find a tremendous amount of value when you take advantage of some often-overlooked frequent flyer programs. A vlogger claimed to have successfully stowed away inside a suitcase on a recent flight. Self-proclaimed “professional idiot” and vlogger Adam Saleh claimed that he zipped himself into a suitcase and flew in the cargo hold on a Tigerair flight between Melbourne and Sydney, Australia. However, the airline has since debunked his claims and has requested that Mr. Saleh remove the video he posted on YouTube. Alaska and Delta will end their partnership as of May 1, 2017. The writing had been on the wall for quite a while, but now Alaska and Delta have made their split official. As of May 1, 2017, the two airlines will go their separate ways, although the two carriers will maintain an interline agreement after the split. Cathay Pacific passengers traveling on separate tickets will once again be able to through-check bags to the final destination. Back in the summer, the Oneworld Alliance got rid of the requirements for member airlines to through-check bags for passengers flying on separate tickets, and Hong Kong-based Cathay Pacific was one member carrier that said it would no longer through-check bags. However, the airline has walked back this policy and will once again provide through-check service for passengers that have booked separate tickets. Aeromexico and Delta have shared that they will form a joint cooperation agreement. This week, Delta and AeroMexico received antitrust immunity from the US State Department allowing the two carriers to move forward with plans to establish a joint cooperation agreement. Once completed, the agreement will create the largest transborder alliance between Mexico and the United States. IHG’s made a few minor changes to elite benefits. 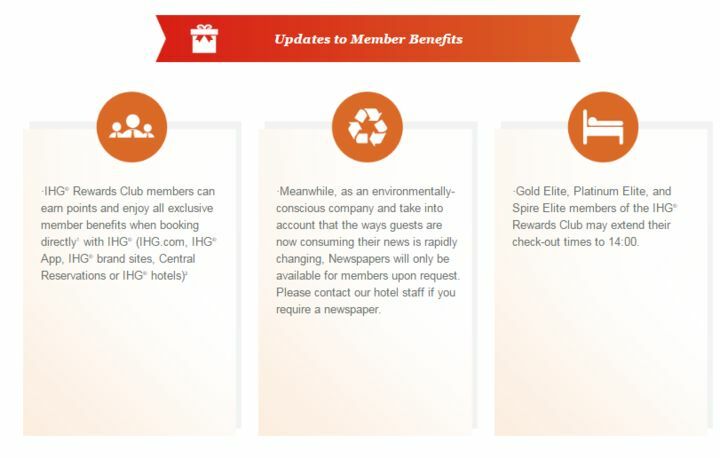 IHG’s made a few tweaks to its member benefits, the most notable of which is that Gold Elite, Platinum Elite and Spire Elite members can now extend their checkout time to 2pm. The Hilton Santa Fe Buffalo Thunder will become a Category 5 hotel as of January 11. Image courtesy of the hotel. Hilton now shifts around its redemption categories quarterly, and this week it released which properties will be going up in price. This time around, 11 properties are moving up in category while none are moving down. Changes will go into effect as of January 11. 2017. Emirates has introduced the world’s first “moisturizing sleepwear for the skies,” which will be available to first class passengers traveling on overnight flights. The new pajamas will employ technology that’s supposed to prevent dehydration and stimulate circulation. Featured image of Alaska Airlines jets courtesy of Getty Images.